The Simpsons (Classic): "Bart Sells His Soul"
The Simpsons tackled Faustian bargains before “Bart Sells His Soul,” most directly in the “Treehouse Of Horror IV”’s “The Devil And Homer Simpson.” The transaction in “Bart Sells His Soul” is unique from that Washington Irving sendup because its stakes are much, much lower. And yet the concept stretches ably to a full 22 minutes by making Bart earn his essence back—and by proving there’s plenty of room to stretch within the episode’s central metaphor. Because in the end, a soul isn’t something that can be bought or sold—it’s inextricably tied to every resident of Springfield. It’s funny to review “Bart Sells His Soul” so soon after “Radioactive Man.” The episodes were part of separate production cycles, but they’re of a piece in that each episode finds Milhouse getting one over Bart. This time around, however, Milhouse relishes the opportunity: Conviction leads him to lord the transaction over his friend, presenting a more menacing Milhouse than the one we’re used to. But he’s still very Milhouse about it: He treats the contract like an accessory in a G.I. Joe: Middle East Conflict playset; later he exchanges Bart’s soul for a handful of pogs. 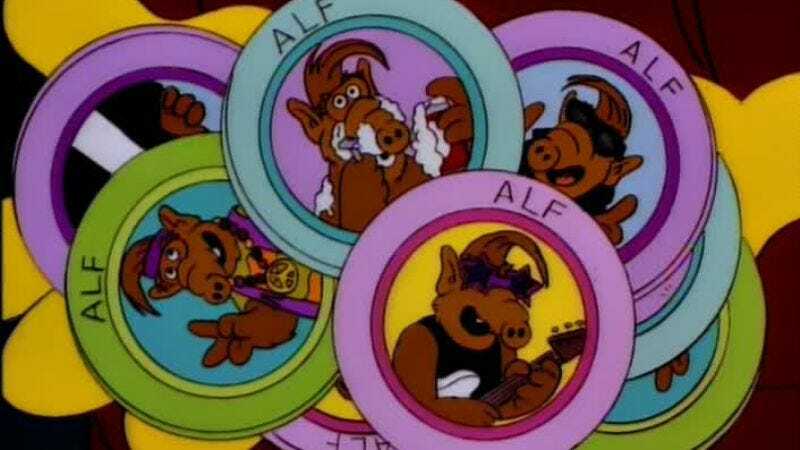 And not just any pogs, but ALF pogs—a classic Simpsons statement on the impermanence of fads and the cheapness of belief. But Moe’s true nature can’t be covered up by an alligator wearing sunglasses. (“Now I’ve seen everything!” Marge exclaims, describing an interior decorating trend whose definitive parody would be called Choctchkie’s.) He’s a surly barkeep, not the grinning proprietor of a Red Robin franchise, and so the descent into madness is inevitable. Ingeniously, it’s not the scalding-hot birthday fries or the “service with a smile” policy that lead to “Uncie” Moe’s undoing. It’s the sugar-sweet, Cindy Lou Who-esque request of an adorable moppet that sends him screaming into the quasi-profane depths of madness. It’s part of “Bart Sells His Soul”’s spectacularly parallel nature that Moe’s big blowup transitions into Bart’s After Hours-esque trip into the Springfieldian night. It’s not rare for a Simpsons episode to contain multiple storylines that slam together in the final act—in ways organic and contrived. But “Bart Sells His Soul” keeps its primary plots from intersecting only on a thematic level. The effect is one that only reveals itself with time (I may have seen this episode more times than any other Simpsons, and it was only this time through that I saw the similarities between what Bart and Moe are going through), but it’s more rewarding for that. The script, by Greg Daniels, is imminently quotable, but the jokes feed the story. By of way of contrast, those jokes largely involve something Bart has lost and something that Moe has gained. And by the end of the episode, their fortunes have reversed. There’s some heady theological stuff beneath the surface of all this, but that doesn’t interest me as much as what “Bart Sells His Soul” has to say about the nature of its characters. The leads in both storylines are tested by circumstance; the outcome is positive for only one of them, but it’s the proper outcome either way. These are desires that have been induced by external forces, and the comic engine of the episode is the chase to fulfill those desires. 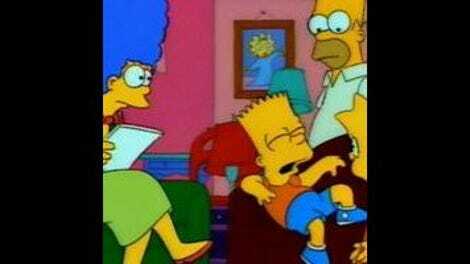 If “Bart Sells His Soul” has anything to say in the value of a person’s spirit, it’s glimpsed in those final moments of Bart and his see-through buddy ramming into Martin’s rowboat. Obeying an authority figure like Lovejoy only does so much for the soul. Being true to yourself is much more spiritually nourishing. On the DVD commentary for “Bart Sells His Soul,” director Wesley Archer expresses his disappointment with the look of the episode, particularly the design of Uncle Moe’s and the blue hues of the dream-sequence souls. I think he’s being a little too hard on himself: The restaurant has the proper amount of clutter to sell the joke, and it’s not like the blue souls come across as Smurf doppelgängers or anything. Reverting to the version of Moe who’s missing a tooth, however, is incredibly distracting.